To significantly boost the amount of genetic information collected about African Americans — which allows people to peer deeper into their ancestry and also to improve their medical care — a California-based genetic-testing company is offering free access to its Web-based service. 23andMe's lab extracts DNA from cheek cells in the saliva and analyzes the sample to provide such information as genetic risk for various diseases and health conditions. The vast majority of genetic research published so far has been conducted in people of European ancestry, with a growing gap in the understanding of the interplay between genetics and health for African Americans. Also, genetic researchers say they have sought out people with European ancestry because that population is far less diverse. The more genetically diverse a population, the larger sample size needed. With Europeans, "you can study 2,000 people instead of 10,000. You can get your results faster," Mountain said. To remedy the data gap, 23andMe launched its new project, Roots Into the Future, during a National Urban League conference in Boston in late July. 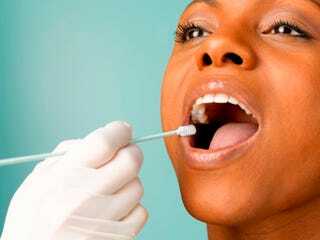 The project's goal is to collect genetic information from 10,000 Americans of African descent. That matches a long-term goal of The Root Editor-in-Chief Henry Louis Gates Jr., director of the W.E.B. Du Bois Institute for African and African-American Research at Harvard and an unpaid adviser to the project. Gates said he has long wanted the DNA of more African Americans to be collected in the 23andMe database. "Everybody seems to be intrigued, to the point of obsession sometimes, about their ancestral past," Gates said. "That's quite exciting for a scholar of African-American studies because so much of our collective past has been hidden, stolen or denied." Some 25 million people have watched his shows on public television about tracing ancestry. But Gates isn't satisfied with folks simply turning on the TV. "We cannot fully tell our collective history in as much detail as I hope it will one day be told until a huge percentage of the African-American community does its family tree and has its DNA tested," he said. Already, there has been a significant uptick in interest, with 3,000 people ordering kits through the Roots Into the Future project so far. "We are really excited by the positive response," Mountain said. "It's been wonderful." Of dozens of 23andMe health surveys, three are the highest priority for the project, Mountain said. One, general health, focuses on conditions that are common among African Americans, while a second survey covers allergies and asthma, and a third homes in on headaches and migraines. Researchers compare people who have the health condition of interest with those who are healthy, searching for places in their genomes where there is a difference. The 23andMe genotyping chip looks at a million SNPs, or single nucleotide polymorphisms, permitting the researchers to study hundreds of health conditions simultaneously. The first goal of 23andMe is to validate genetic markers — which have been identified in other ethnic groups — that have an influence on disease risk. "In African Americans, no one has tested it," Mountain said, referring to validation of the markers. "No one knows if it holds up." The next goal is to identify new genetic markers for African Americans for pressing diseases, such as diabetes, prostate cancer and heart disease. The company promises to share all of the data with the participants, thus "empowering consumers," said Anne Wojcicki, 23andMe co-founder and chief executive. One of her "pet peeves" with the traditional research model is that it doesn't give such critical information to participants. In addition to providing genetic risk factors for various diseases and health conditions, the free service offers Web-based tools to find and connect with living relatives through their matching DNA. Wojcicki said it's "tragic" that some communities are underrepresented in genetics research, since the research has the potential to improve everyone's odds of having healthier lives. It's a lesson she learned personally. The 23andMe results for Wojcicki and her husband, Google co-founder Sergey Brin, prompted the couple to make changes to help improve their health. Because of the risk for macular degeneration, a leading cause of vision loss in Americans 60 and older, Wojcicki gives her extended family sunglasses as birthday and holiday gifts. And her higher risk for breast cancer led her to cut out social drinking, since alcohol consumption has been cited as a risk factor in some cancers. She said that her husband's heightened risk for Parkinson's disease, a neurological disorder that affects nerve cells in a part of the brain that controls muscle movement, was a motivating factor for Brin's weight loss. "It's definitely had a big impact," she said. For more information about Roots Into the Future, go to 23andme.com/roots/. UPDATE: Because of regulations, sample collection kits can be shipped to New York, but sample collection and return shipping must take place outside of the state of New York; kits cannot be shipped to or from Maryland. Diedtra Henderson is a freelance science and technology writer.